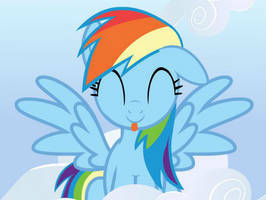 Hiya, everypony! I've been working on something new lately that I thought would be nice to share with you. On the "Nightly Discussion" posts on the website Equestria Daily, I've started an interactive adventure series called "Adventures in Equestria" (AiE). I've been writing out an episodic story where the reader is a character named "Mad Scientist," who is the first and only human to find a way to Equestria. However, the plotline is determined with the help of the EqD community! At points where certain choices can be made by the character, it is up for those in the discussion to decide what happens next. The result? A community-run adventure where anything can happen! I've decided that I will upload adventures here after they are written to serve as an archive for anyone interested, as well as to help people catch up on what's happened. We get to see an epic storyline develop through which the MLP community can express itself and I can get a hang of my writing skills. I am planning on uploading the AiE episodes to here soon. If you wish to participate, join the conversation at the latest "Nightly Discussion" (ND) post over on Equestria Daily. There is a new episode for every one to three discussions. They usually start between 1:00 and 1:30 after the discussion's start. Hi there! I recognize you from EQD!! thanks for watching me!! No problem! Keep up the great work!